The Cybex VR1 Seated Leg Curl station features an innovative design that makes positioning the tibia pad very intuitive and virtually effortless resulting in an easily accessible and easily adjustable machine. The offset input arm enables adjusting the lower leg pad with little effect on the starting angle of the knee which, in combination with proper pivot location, allows using a contoured pad for improved comfort. Additionally, the angled back pad is wider (100 degree angle between seat and back) than most leg extension machines to efficiently relieve hamstring tension. 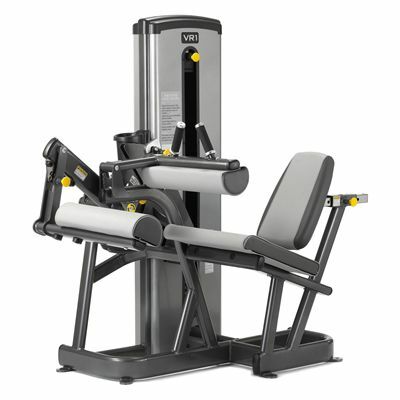 The station also offers the Adjustable Start System to accommodate different motion ranges of individual users, while its thigh stabilization system significantly reduces shear at the knee compared to other machines. for submitting product information about Cybex VR1 Seated Leg Curl We aim to answer all questions within 2-3 days. for submitting product information about Cybex VR1 Seated Leg Curl. We aim to answer all questions within 2-3 days. If you provided your name and email address, we will email you as soon as the answer is published. for submitting product review about Cybex VR1 Seated Leg Curl.